The French verb for segment is the regular ER verb segmenter. 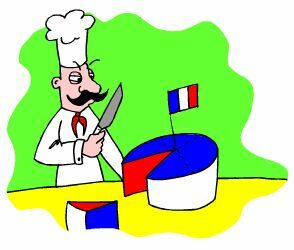 To remember this imagine SEGMENTING a French camembert cheese in the French colours. Such an image, viewed vividly in your mind will make it easier to remember and recall the word. Adding the French colours to the image will remind you that word is similar in French to the English verb. Adding in a cartoon Memory Trigger makes it even easier to remember. segment! segmente ! segmentons ! segmentez ! ⇒Segmenter is a regular French ER verb conjugated with the identical pattern of verb endings as 5,000 regular ER verbs. ⇒Learn segmenter and it will reinforce the pattern for ALL those other ER verbs. ⇒Do these verb drills daily, and after 30 days you will really have a rock solid knowledge of the ER verbs' conjugation patterns. In ALL the French verb tenses. ⇒Repeating the conjuguated verb tables aloud 10 times will better embed the patterns into your subconscious, and your long term memory. ⇒Reciting the verb table aloud is a great way for you to practise your pronunciation, and helps you to memorize the conjugations of all these important French tenses. ⇒ They feature French verbs like the French verb segmenter - French verb segmenter. ⇒ You can more easily remember words like the French for segment - segmenter using the techniques of the world's Memory Masters.